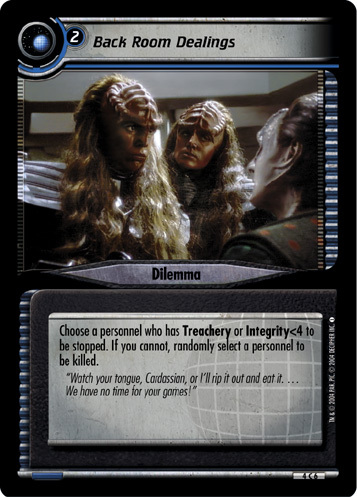 Unless you have Diplomacy and Cunning>30 or Leadership and Strength>30, all of your personnel are stopped and this dilemma returns to its owner's dilemma pile. "While in our space, your vessel will not exceed warp three, and your weapons systems will remain off-line. You will avoid unnecessary scans, and you will not conduct surveys of any kind. You will make no attempt to explore our space. 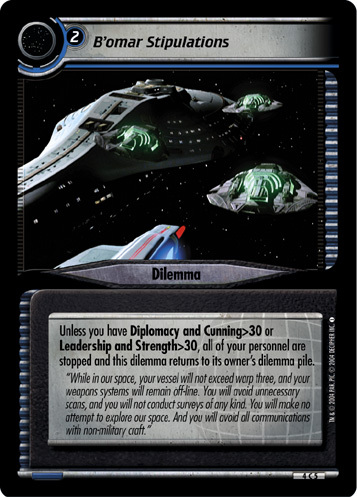 And you will avoid all communications with non-military craft."